Keune Care Line Man Fortify Lotion Scalp stimulating lotion that cures premature hair loss with regular use. Stimulates the growth of healthy hair from root to end. 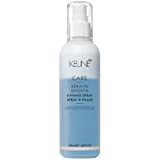 Keune Care Line Derma Activating Lotion is a cure treatment for temporary hair loss and thinning hair. Rejuvenator Technology penetrates the cells of the scalp where liposomes gradually deliver the Essential Minerals Biotin and the hair growth stimulants Takanal and Caffeine with Keune Care Line Derma Activating Lotion. It strengthens and repairs the hair with Rock Crystals, Red Gingseng, Menthol, Vitamin H and Essential Minerals. The formula has a stimulating and cooling effect to conquer thinning hair. It stimulates the scalp to generate healthy hair growth. Use after shampoo, do not rinse.